Upon arriving to the scene, Animal Friends and Association of Animal Friends "Dr. Ivan Rostas" established that the cows were in a serious condition and they began negotiating with both Croatian and Bosnian sides. Eventually, there was an agreement that the cows should be transported over the border to Bosnia and Herzegovina and unloaded at the nearest resting point, after more than 60 hours on truck. At this moment, the truck is still at the border, on the side of Bosnia and Herzegovina, and Animal Friends hopes that they would be allowed to accompany the cows to the unloading point, making sure that their requests have been fulfilled. Animal Friends wishes to emphasize that this is not an isolated case; lots of animals have to suffer at Croatian borders. The border crossings as such do not satisfy the requirements of animal transport in the least, since there are no facilities for animal care in case of deficient paperwork and the customs officers are not willing to do their best to prevent the detention of animals at border crossings, where they should not be allowed to remain in the first place. Moreover, Animal Friends is of the opinion that Croatia should not allow the transport of animals through its territory, since it does not fulfil the relevant requirements. And Croatian citizens are obviously not willing to support cruelty to which animals are subjected during transport. 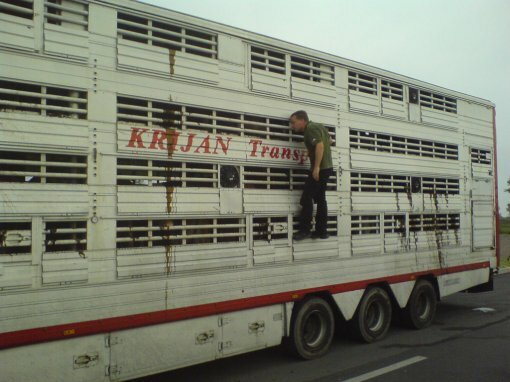 Animal Friends is also wondering why it was allowed in the first place that pregnant cows should suffer transport all the way from Czech Republic to Bosnia and Herzegovina, and it demands that Croatia should ban live animal transport altogether.